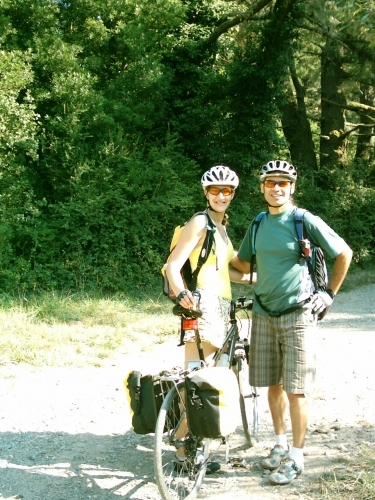 Ever since I told my wife that I'll be doing an overnight ride to Point Reyes with some bicycle friends I've been thinking it would be nice for the two of us to go on our own overnighter. 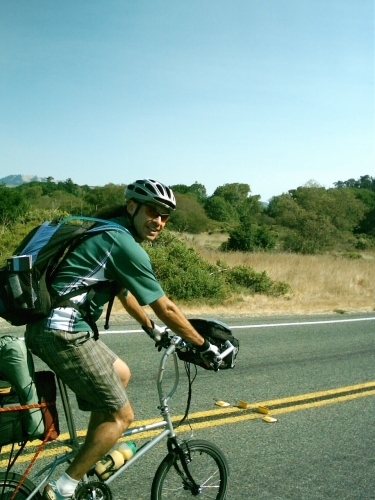 We haven't done any bicycle touring together since we went to Baja California. Lately, she has been working a lot and the way I see it, anytime is a good time to change the daily routine. Since the weather forecast for the weekend was good I brought up the idea and she was into it, cool. It never takes us much time to get ready to go anywhere, we are used to the quick pack and go so this time would be no different. Point Reyes campgrounds are in high demand on Fridays and Saturdays (Reservation is highly encouraged by park rangers) but from Sunday to Thursday it's usually very easy to get a site. One of the benefits of both of us being freelancers is our flexibility with time off, leaving on Sunday returning Monday sounded like a good plan and we would avoid the crowds. Without rushing, we left San Francisco Sunday morning at 9:45 am and headed towards Sausalito. We were out of coffee at home and both really felt like having some, after a quick stop at a small coffee/breakfast place on Sausalito's Caledonia St. we were then good to go. The easiest way to get to Point Reyes from San Francisco is by following the bike route many local riders take, Sausalito, Mill Valley, Corte Madera, Larkspur, Ross, San Anselmo, Fairfax... Chatting and riding at an easy pace we arrived in Fairfax fast. While Monica went to the Bike shop to use the restroom, I waited outside unaware that my rear tire was going flat. When she returned and we started riding again the rear of my bike felt weird, sure thing I had a flat. While I replaced the tube she got us some iced coffee across the street at the Java Hut, then she was off to a head start while I finished packing things up. 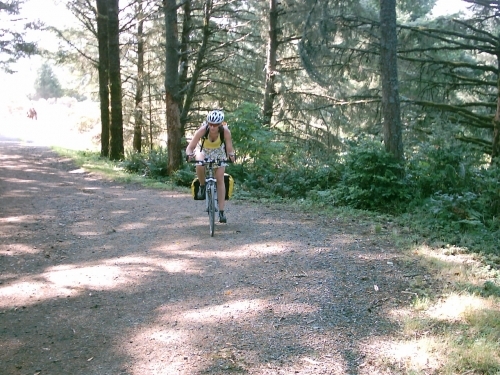 I caught up with her right before White Hill, the end of the "Bay Area" urban sprawl. On the other side of the hill is the small town of Woodacre usually overlooked by cyclists. I love to stop at the Woodacre Deli for sandwiches, they alone are worth, for me, riding from San Francisco the 25 miles to get them. We had a couple of sandwiches for lunch and carried-out two more for that evenings dinner, yum. With happy tummies we continued towards Point Reyes ranger HQ's, by 2:30pm we where there. I went in, got the $15 permit (you must have permit in order to camp in one of the four campgrounds) and then we continued passed the turn off towards the trail head to get some other food for the afternoon and the next day's breakfast. A couple of beers some candy bars, orange juice and some little yummy powdered donuts. After backtracking the 2 miles to Limatour Rd we enjoyed low traffic and nice views for about a mile then the road started climbing but nothing too steep (2.5 miles) Finally, there it was, Sky Trailhead, from here it is 1.5 miles to camp. The fireroad was in good condition and our bike slick tires had no problem gripping and climbing. Finally at 3:40pm we arrived, it had been a beautiful day so far, we where assigned camp site #9 and soon found it. While I fought the mosquitos, lots of them, and erected the tent Monica explored a little. All except one camp site was empty and site #10 had a very nice view and a larger flat spot for the tent, we decided it was worth to take the chance of being moved later on and took our stuff over there. After I was done with the tent we got some water (all Point Reyes campgrounds now have drinkable water but no showers). For taking a shower, I have this gizmo that turns a Platypus bladder into a shower. Site #12, also empty, had a nice pine tree from which I hung the "shower". We changed into our bathing suits and took a shower, ah so refreshing! The rest of the afternoon we just hung out at our site and admired the beautiful sunset over the fog line, it had been a perfect day. Overnight temperatures were very pleasant, there was an animal near the tent digging a hole that kept me awake for a while but by 7:00am I was rested and ready to get going. We packed things up and ate breakfast. Oh man! a flat tire again? While I replaced the tube Monica got ready. No wonder I had a flat again, I had missed an almost invisible wire that had entered the tire, this time I took care of it for good. We were rolling by 8:45. Olema came fast so a quick stop for coffee was needed before the hill. 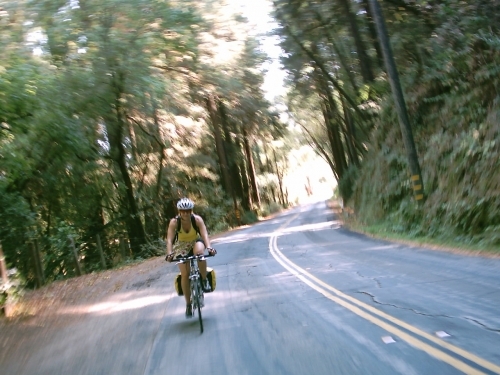 We backtracked yesterday's ride and found ourselves in San Anselmo around noon. Right when we where leaving a coffee shop there, a couple on fully loaded bicycles went by. At the first traffic light we caught up with them, they were not familiar with the way to San Francisco so I point them in the right direction. Soon after I was talking with Randy and Monica is talking with Nancy. Now the miles are really flying, they told us they started in North Canada and are on their way home to Denver where they will be stopping before continuing on to the most southern tip of South America, nice plan! (hobobiker.com) We rode with Randy and Nancy all the way to San Francisco stopping for all the must-haves pictures. Once we hit the San Francisco side of the Golden Gate Bridge we parted ways. Weather today was also spectacular, we were very lucky. It had been a great gateway, we are lucky to live we live, I love it. very helpful... im going off this weekend!